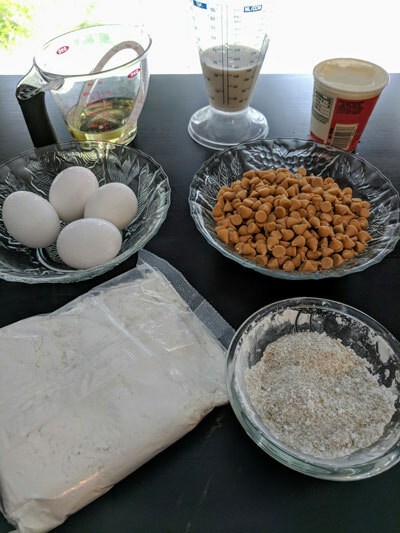 Alright, dear readers, we’re taking a jump to the left and a step to the right and traveling back in time with the most recent installment of one of my favorite culinary cozy series (God willing and the creek don’t rise, we’ll close out the books we’ve missed for this column by the end of 2018!). This 23rd book in the Hannah Swensen series takes place entirely in the year that Hannah decides to leave college for good, having returned to Lake Eden to help her mom in the aftermath of her father’s death. Delores is having a hard time coping with the loss of her beloved husband, and her daughters worry that grief is keeping her homebound for far too long. 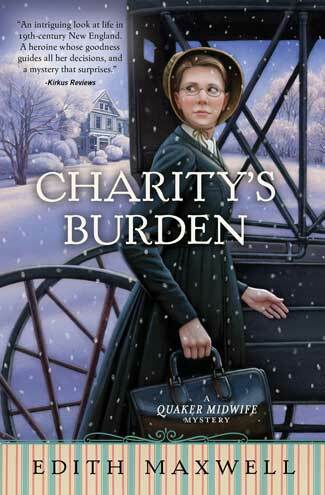 So when Grandma Knudson, the formidable head of the Lutheran church’s social scene, comes calling, it’s a great relief to Hannah, the newly pregnant Andrea, and high-schooler Michelle. Grandma Knudson intends to draw their mother out by requesting her help for someone in even more dire straits: Essie Granger, the elderly owner of the now-shuttered Albion Hotel, who has suffered a bad fall and is in hospice care. In order to help cheer her up, Grandma Knudson has decided to recreate the famed Christmas Ball from the Albion’s heyday and will need the Swensens’ help to do it. 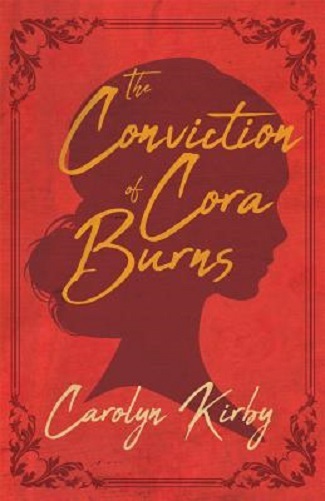 While gathering essential items for this undertaking from Essie’s rooms in the Albion, Hannah stumbles across a set of notebooks that seem to detail the thrilling adventures of a young woman named Rose in New York City. With Essie’s permission, she reads the story aloud to her family (plus Michelle’s friend Lisa, who we all know will eventually become Hannah’s business partner) over the course of their preparations for the ball. 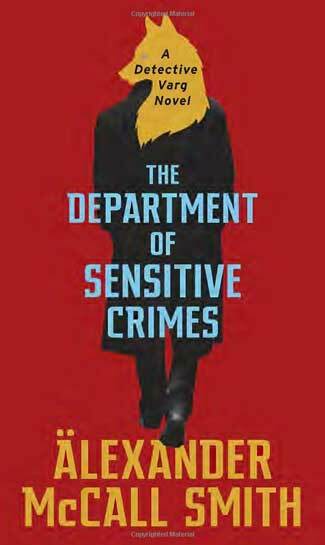 The women all marvel over Essie’s talent for writing crime fiction—until things start happening that indicate that perhaps the story is based on reality, with enduring repercussions. Prepare your cake pan. You’ll need a Bundt pan that has been sprayed with Pam or another nonstick cooking spray and then floured. 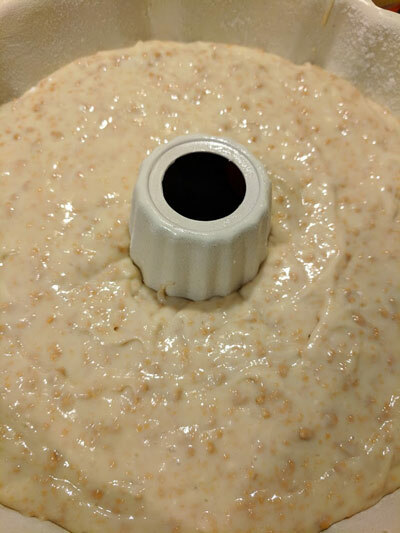 To flour a pan, put some flour in the bottom, hold it over your kitchen wastebasket, and tap the pan to move the flour all over the inside of the pan. Continue this until all the inside surfaces of the pan, including the sides of the crater in the center of the pan, have been covered with a light coating of flour. Be sure to shake out the excess flour. Crack the eggs into the bowl of an electric mixer. Mix them up on LOW speed until they’re a uniform color. Pour in the half-cup of vegetable oil and mix it in with the eggs on LOW speed. When everything is well combined, open the box of dry cake mix and sprinkle it on top of the liquid ingredients in the bowl of the mixer. Mix that in on LOW speed. Add the package of instant butterscotch pudding and mix that in, again on LOW speed. Finally, chop up the butterscotch chips in a food processor or blender and then sprinkle them into the mixer. Mix in the chips on LOW speed. Shut off the mixer, scrape down the sides of the bowl, and give your batter a final stir by hand. Use a rubber spatula to transfer the cake batter to the prepared Bundt pan. Smooth the top of your cake with the rubber spatula and place it in the oven. Bake your Ultimate Butterscotch Bundt Cake at 350 degrees F. for 55 minutes. Before you take your cake out of the oven, test it for doneness by inserting a cake tester, thin wooden skewer, or long toothpick midway between the sides of the circular ring. If the tester comes out clean, your cake is done. If there is still unbaked batter clinging to the tester, shut the oven door and bake your cake in 5-minute increments until it tests done. Once your cake is done, take it out of the oven and set it on a cold stovetop burner or a wire rack. Let your cake cool for 20 minutes in the pan, but no longer than that. Use your impeccably clean fingers to pull the sides of the cake away from the pan. Don’t forget to do the same for the crater in the middle. Tip the Bundt pan upside down on a platter and drop it gently on a towel on the kitchen counter. Do this until the cake falls out of the pan and rests on the platter. Cover your Ultimate Butterscotch Bundt Cake loosely with foil and refrigerate it for at least one hour. Overnight is even better. This recipe is made in the microwave. 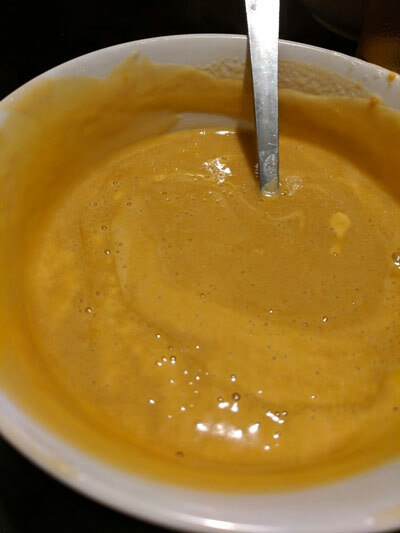 Place the cup of butterscotch chips in your food processor or blender. Chop them into smaller pieces so they will melt faster. Place the Cool Whip in a microwave-safe bowl. Add the chopped butterscotch chips to the bowl. Microwave the bowl on HIGH for 1 minute and then let it sit in the microwave for an additional minute. Take the bowl out of the microwave and stir to see if the butterscotch chips have melted. If they haven’t, heat in 30-second intervals with 1-minute standing times until you succeed in melting the chips. Take the bowl out of the microwave and let it sit on the countertop or on a cold stovetop burner for 15 minutes. This standing time will thicken the icing. When the time is up, give the bowl a stir and remove your cake from the refrigerator. Frost your Ultimate Butterscotch Bundt Cake with the frosting and don’t forget the crater in the middle. You don’t need to frost all the way inside the crater. That’s almost impossible. Just frost an inch or so down the cavity. Return your cake to the refrigerator for at least 30 minutes before cutting it and serving it to your guests. This definitely satisfied my sweet tooth! 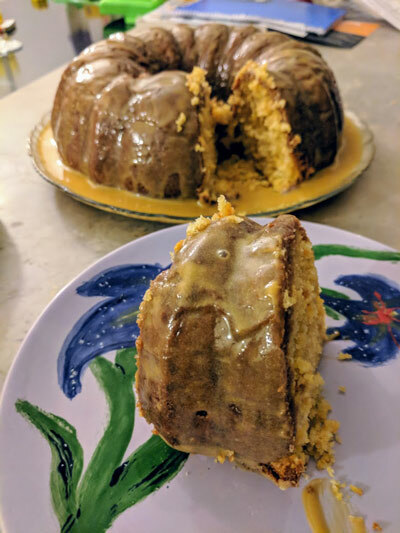 I’m not sure if I’ve ever made a Bundt cake before—and if I have, it must have been an entirely forgettable experience—so this was definitely a memorable and rewarding first. 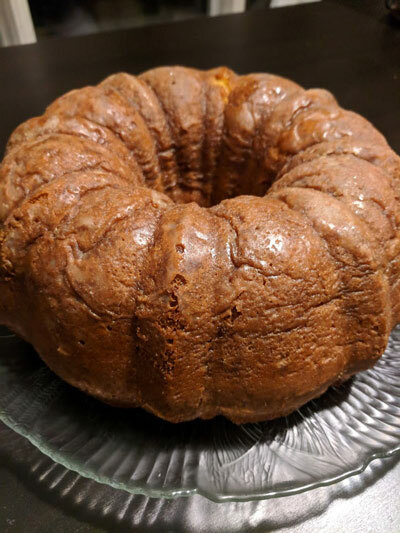 The cake was delicious and quite easy to make, though I did have trouble finding butterscotch pudding at the grocery store. I wound up mixing some dry milk with brown sugar, cornstarch, and a pinch of salt to make up for it. 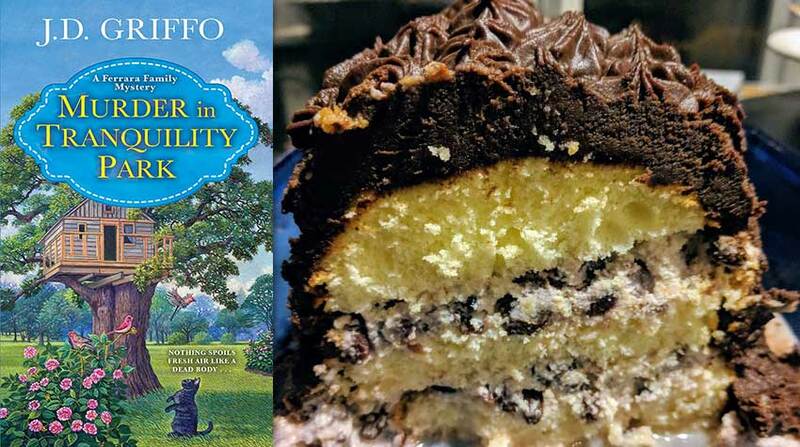 The frosting was likely the most difficult part of this recipe. 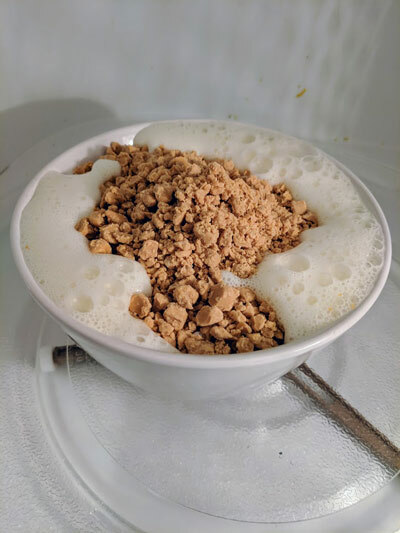 The butterscotch chips took forever to melt in the frozen Cool Whip, and when the frosting finally came together, it went on as a thin glaze that only really thickened after a night in the fridge. That said, this is a cake that can sit in the refrigerator for a few days without suffering any decline in taste. It isn’t the cleanest cutting cake, but it definitely makes up in taste what it might lack in presentation. Next week, we make a quick trip south for Mardi Gras celebrations and a delectable stew before heading back to present-day Lake Eden to find out if Hannah really will marry That Guy. Do join me! It’s in my review from the previous week, of Winnie Archer’s The Walking Bread. There’s a very convenient link to it at the end of the article above, if you’d like to check it out! 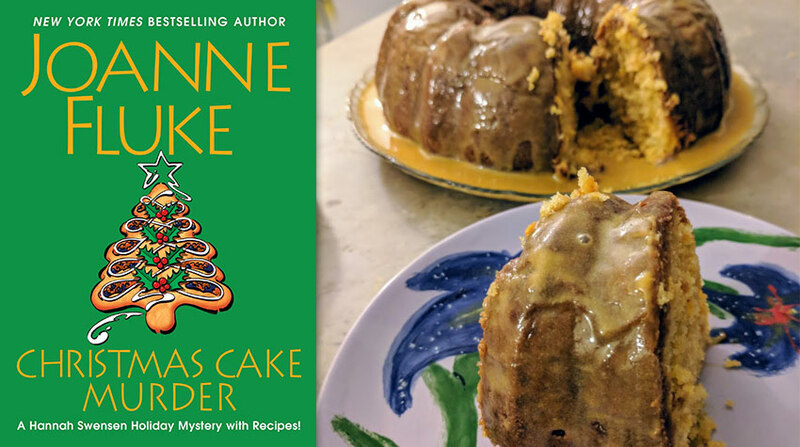 I am looking for the lemon cake from the Christmas Cake Murder. I just read the book but have back-paged and can’t find it to save me. Help! It’s on page 113, I believe. E-mail me directly if you need help!